This photo, taken in July, is just inside the entrance to Hollywood Studios. At the center of the photo is The Darkroom camera shop which sits on the corner of Hollywood Boulevard. This area of the park is supposed to represent the Hollywood of the 30s and 40s. If you look at the billboard atop the Darkroom, you will see "Hollywoodland." This keeps with the pre-1950 story as the famous Hollywood sign dropped the "LAND" in 1949. This is just another little example of details that are overlooked by the average guest. For the first time on Digital Disney World, I am re-visiting a website for a follow-up. Back in early July, I wrote about The Relocated Tourist blog created by Craig and Amy Falk Petermann. On their site, Amy and Craig have told their story of moving from Wisconsin to Central Florida to live close to the Disney magic. They started writing about their intentions to relocate back in February of 2010. Along with their two daughters, they made the big move in June of this year, and have brought us along for their continuing journey. After settling into their new home in Kissimmee, the content of the blog changed quite a bit. Leading up to the move, they mostly talked about the preparations that were necessary to make this huge life change. They wrote about everything from the practical aspects of relocation to the emotions they would have to deal with in leaving the security of their familiar surroundings to start living their Disney dream. Once they became Florida residents, they began discussing the challenges of acclimating to their new life. With Craig working full time, Amy is at the helm of The Relocated Tourist and she has done an outstanding job of keeping the blog fresh and continuing the story of the Petermanns. Since my original article in July, Amy has added many new features to the blog. The two most recent additions have prompted me to write this second article on The Relocated Tourist. First, a few weeks back, Amy introduced a new section of the blog entitled Insp"ear"ationals. The strength that the Petermanns have shown in having the guts to make such a big change and follow their dream has been very inspiring to those of us who read their blog. Many people have written to them expressing gratitude for sharing their story. Because of this, Amy decided to allow readers to share how they've been inspired on the site. For several people, the Petermanns have provided the inspiration needed to help them decide to relocate. Others, like myself, have been inspired to continue to follow our passions knowing that our Disney dreams can also come true. Amy was nice enough to post my story in the newly created Insp"ear"ationals section of The Relocated Tourist. The most recent feature was added to the blog just a few days ago. It is a series of short videos called Atmosphere Adventures. These video logs or "vlogs" are simple little recordings taken on the most incredible handheld device available today. For those of you who are regular readers of Digital Disney World, you know that I can only be talking about the iPhone. In a nutshell, Amy walks through an area of Walt Disney World and takes a roughly three minute video of the surroundings (atmosphere). There isn't any unnecessary narration or editing. It makes the viewers feel like we are actually walking through the area ourselves. For most of us who are diehard Walt Disney World fans, our love for this place isn't just about riding the rides. Most of us enjoy the "feeling" we get just walking around the parks. Amy understands this and helps to bring those feelings to us through these new video segments. I normally don't review such new material, but this concept highlights what Digital Disney World is all about. I can't think of a better example of "using modern technology to stay connected to the vacation kingdom" than posting current iPhone videos from the Disney parks. I look forward to each new Atmosphere Adventure that is posted and hope that this is a permanent feature of The Relocated Tourist! The Petermanns' blog has really become so much more than the story of a relocated family. Even if you aren't considering making a big move to Central Florida, there is much to enjoy on The Relocated Tourist. I had the pleasure of meeting Amy and Craig while on my most recent Walt Disney World vacation over the summer. They are truly wonderful people who I owe a debt of gratitude. After my first article on The Relocated Tourist back in July, Amy mentioned Digital Disney World on Facebook. They also included my blog in the "Favorite Links" section of their site. Shortly after, my readership grew rapidly and that trend has continued ever since. I can't recommend The Relocated Tourist enough, whether you are considering a big move or just enjoy everything about Walt Disney World! One of my favorite attractions in Walt Disney World is the Kilimanjaro Safaris at the Animal Kingdom. It isn't necessarily the ride or even the animals that amaze me. What impresses me so much about this attraction is that this 100 acre African savannah was literally "created" by Disney. This picture was taken back in June of 2002, and it looks like we are out in the middle of Africa. The temperature on this particular summer day made it feel like Africa too. The landscape looks like it has been there forever, yet just four years earlier this entire area was just completely flat dirt! There is simply no better company than Disney at creating incredible attractions that truly immerse you in a completely different place or time. There is nothing artificial on the "safari" that makes you think you are in a theme park. Chester and Hester's Dino-Rama is an area inside Dinoland, U.S.A. at Disney's Animal Kingdom. It is designed after a midway that might be found at a state fair. This picture, from our trip in January of 2010, features our son driving this "cutout" of an old style convertible. Kids love this area of the park. This painting is hanging in the Solarium at the Beach Club Resort. The Solarium is a quiet sitting area not far from the gift shop. I had the opportunity to take a close look at the paintings on our trip in January of this year. If you look closely at this one, you'll see a couple of great hidden Mickeys. First, you can see the cloud formation in the upper right corner is a Mickey face. If you zoom in on this photo, you can see that a woman is sitting on a Mickey towel, next to the blue umbrella. This is just another example of the fun hidden details that can be found in even the fanciest resorts! This photo of the entrance to the Chinese Theater is from our April of 2008 trip. It is an amazingly detailed replica of the original theater built in Hollywood in 1928. The Hollywood Studios facade is identical in size to the one found out in California. For over a decade, this building served as the "Cinderella Castle" of the park, as it was the icon (or weenie) that could be seen when looking down Hollywood Boulevard. Since 2001, a giant Sorcerer's Hat has sat directly in front of the Chinese Theater, obstructing its view. Most Disney World purists, including myself, are disappointed that the hat has become a permanent fixture. However, the Great Movie Ride (which is housed inside the theater) has remained nearly identical to what it was on opening day. Modern technology, in many cases, can be viewed as both a blessing and a curse. Many of us embrace the "latest and greatest" in electronic gadgets while others have no interest. This dichotomy is certainly apparent when speaking of the smartphone revolution. Although these powerful, handheld devices are supposed to make life easier, they can be complicated, especially for those who aren't tech savvy. It is unfortunate that many people shy away from taking the leap into this realm simply because they assume that it will be too difficult. The truth is that many of these smartphones, including the iPhone, are very user friendly. As I've written about many times in this blog, there are a bunch of great apps available that are designed to enhance your Walt Disney World vacation experience. The Mouse Memo app is no exception. Mouse Memo is designed to be used on an iPhone, iPod touch, and iPad. In a nutshell, it is a great little organizer that lets you store all of your vacation reservation information in one place. This info is stored under the headings of flights, ground transportation, hotels, dining, and entertainment. As you are booking your trip, you simply tap on the appropriate category and fill in the blanks. Whenever you need to recall anything related to your vacation, you will have it at your fingertips. The ability to quickly access this information can come in handy, especially when checking in at the airport or at a restaurant for a dining reservation. It sure beats having to carry around a binder with a bunch of printouts! Each reservation category includes unique fields for you to fill out. For example, the dining section allows you to choose a restaurant, party size, deposit and whether or not you are using the "Dining Plan." Several of the categories have extensive databases to assist you in making your selections. The dining, entertainment, and hotel sections have complete lists of on-property offerings, including phone numbers and addresses in many cases. 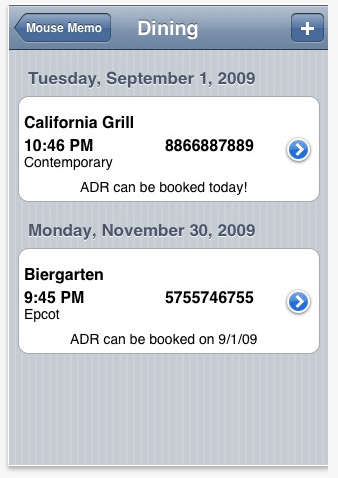 Another great dining feature is the ability to quickly pull up the basic information about each restaurant. As an added bonus, there is a link to the menus which are found over at AllEars.net. This can actually help you make your decisions as to where to book your advanced dining reservations (ADRs). When it comes to simplicity, it doesn't get any easier than the Mouse Memo app. Sure, you can jot down your reservation info in a notebook or even print it out from your computer. However, it is 2011 and there is no reason to be jotting or printing when you can use a smartphone instead. You can pick up an iPhone these days for as little as FREE, if you are willing to sign a two year agreement with your wireless carrier. If you are new to the smartphone revolution, take some time to learn what your device can do. I often chuckle when I see my dad carrying a handful of index cards in his breast pocket with to-do lists, appointments, and other notes, while he has something called a Blackberry clipped to his belt. However, most people of his generation don't want anything to do with smartphones, so he is definitely advanced in more than just age! I highly recommend checking out the Mouse Memo app to help you on your next trip to Walt Disney World. It is available in the Apple App Store and only costs 99 cents. It will certainly help you keep your reservations organized and alleviate the need to carry around that old fashioned stuff we call "paper." Now that Christmas season is officially underway, I thought I would start posting some relevant pics. This shot was taken in the Grand Floridian Resort lobby back in December of 2008. As you can see, the Christmas decorations are certainly not limited to the parks. One of our son's favorite attractions is the Walt Disney World Railroad, which we of course rode on our most recent trip in July of this year. I thought it appropriate on Thanksgiving to post this picture of the Native American scene that is viewed while riding the railroad. It can be seen between the Frontierland station and soon-to-be open Fantasyland station. Happy Thanksgiving! In January of this year, we stayed at the Beach Club Resort, which has easy access to Epcot. This slightly educational boat ride in the Mexcan Pavillion was refurbished a few years ago and now features Donald Duck, Jose Carioca, and Panchito Pistoles. They are the three main characters from the 1944 animated film, The Three Caballeros. This ride instantly became more entertaining for kids and is now one of our son's favorites. I have reviewed many Walt Disney World apps over the past year, and every one of them has been compatible with the iPhone. 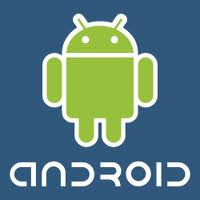 Today, I'm jumping off the Apple bandwagon and I'm going to write about an Android exclusive app for the first time. No, I have not lost my mind and actually defected from the king of all smart phones with the little fruit logo. However, I am currently using the latest HTC Android device for work (at my other job), and have been introduced to an app that simply can't be overlooked. When I came to work today, I was happily surprised to meet a new employee who is quite possibly as big a Disney World fan as myself. I didn't think this was possible, but when we we started chatting about Hidden Mickeys, Main Street Windows, and little known bits of trivia, I knew that I had met my match. Of course the conversation eventually turned to a comparison of Disney cell phone apps, and my new friend Annie introduced me to the Disney World Ride Videos App. I was a little disappointed to hear that it was exclusively for Android phones, but it gave me a chance to break in my new work phone, the HTC Vivid. I am usually reluctant to embrace any handheld device without an "i" in the name, but since this app is not yet available in the iTunes App Store, I decided I should give it a try on the Android, and I'm very glad that I did. 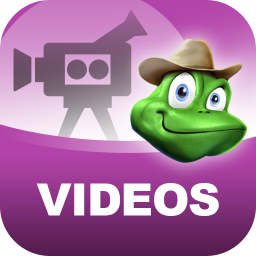 The full name of the app is the "Disney World Ride Videos App in HD." It is put out by the folks over at UndercoverTourist.com. 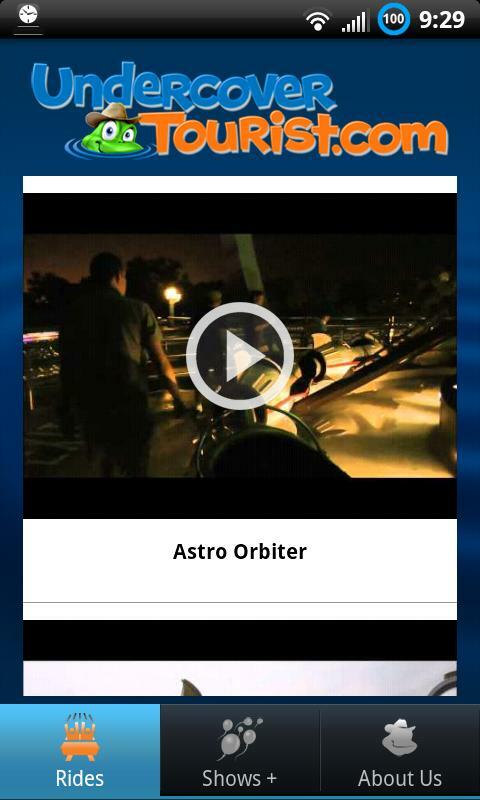 In a nutshell, this app allows us to quickly select high definition attraction videos at the touch of a button. These are quality videos shot by the app developer that allow us to experience a majority of the rides and shows at Walt Disney World right on our cell phones. In addition to the standard attractions, there are also special events such as the Boo To You Halloween parade and Holiday Wishes. 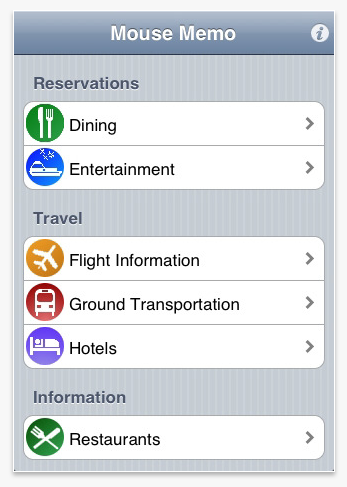 The app is very simple in design, and all of the clips are alphabetically organized under each of the four parks. You simply choose a park and then select either "Rides" or "Shows" at the bottom of the screen. You will then find a play "button" over each attraction which takes you to the corresponding video which is actually found in YouTube. The fact that they can be seen in YouTube is good news for those of us who are iPhone users. We can "subscribe" to the Undercover Tourist channel and view all of these great videos from our phone or even right on our computers. However, Android users certainly have an advantage because the Disney World Ride Videos app is so well organized and it makes it very easy to search for your favorite attraction. For anyone looking to get their Walt Disney World fix in between visits, I certainly recommend this app. 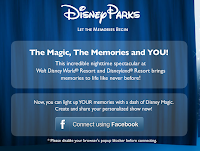 It is also a great way to relive memories of a recent trip or to get excited about an upcoming Disney vacation. Another great thing about the app is that it is FREE! Hopefully, iPhone users will see the Disney World Ride Videos app showing up in the App Store in the near future. If you don't currently have an Android phone, you should at least check out the great selection of videos from the Undercover Tourist over at YouTube! This picture was taken in December of 2008. With Mickey's Very Merry Christmas Parties now in full swing at the Magic Kingdom, I figured it was time to post this shot of Cinderella Castle adorned with icicles. This is one of those sights that a photograph just can't do justice. If you haven't taken a Disney World vacation near the holidays, I certainly suggest planning one in the future. Although the temperature doesn't typically make it feel like Christmas when in Central Florida, Disney does an amazing job of creating a festive atmosphere for the holidays. They even make it snow on Main Street! DDW Pic 87. Main Street, U.S.A. This photo was taken in March of 2006. This balloon vendor is in the middle of Main Street, U.S.A. in front of the Emporium. She had to have been holding over 50 balloons. If I would have had the chance, I would have asked her two questions. First, how is she not floating away like the house from UP? Second, how are those balloon strings not getting tangled? This picture was taken back in April of 2003. I was standing on a bridge on Tom Sawyer Island looking toward Liberty Square in the Magic Kingdom. Across the Rivers of America you can see an old dock that was used for the Mike Fink Keel Boats from 1971 to 1997. You can also see the top of Cinderella's Castle in the distance. As I've said many earlier posts, I love going over to Tom Sawyer Island. Not only is it a great place to get away from the hustle and bustle, but it also provides great views of Liberty Square and Frontierland. This picture was taken in September of 2009. This is the front of the coaster as seen from the queue. Notice the grill and license plate at the front of the "limo." You can also see the speakers that our positioned right behind each guest's head that play Aerosmith tunes throughout the ride. Like most attractions, the detail inside the Rock 'n' Roller Coaster queue are amazing. The theme of the ride puts us in a nighttime back alley scenario, which can be seen on the other side of the track. You can see a dirty, dingy building exterior with stained walls and pavement. As always, Disney does a great job of creating a story to go along with the ride. 81. O.T.D. - 11/18/28 - Mickey Mouse is Born! Today, we say happy birthday to the one and only Mickey Mouse. Although my "On This Date" series is typically dedicated to events related to Walt Disney World history, I felt it important to highlight this particular day because of its significance. Mickey is the character who really started it all for the Disney company. It can be argued that without the creation of Mickey Mouse, the Disney parks may never have been built. There are some interesting stories related to the history of Mickey Mouse and how he was created. First, Walt's original "main" character was Oswald the Lucky Rabbit, which he created for Universal Studios. With the Oswald series going strong, Walt asked for an increase in the budget in 1928, but was told the budget would actually be cut by 20%. He angrily refused the deal, finished out the contract, and lost Oswald to Universal. He also lost a majority of his staff in the ordeal. However, a few loyal artists remained, including Ub Iwerks. Walt asked Ub Iwerks to draw up some new character ideas. He created several animals, but Walt wasn't to excited about any of them. Walt got the inspiration for Mickey from his old pet mouse who used to live on his farm. 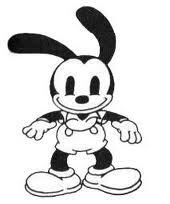 He had Ub create the new character who Disney originally named Mortimer Mouse. Walt's wife Lillian thought that Mortimer wasn't the best name choice and convinced Walt to change the name to Mickey. Can you imagine the Mortimer Mouse Club, or hidden Mortimers, or even Mortimer's Very Merry Christmas Party? It just doesn't have the same ring as Mickey. The world owes a debt of gratitude to Lillian Disney for coming up with the name for who is probably the most famous animated character in history. So how does November 18th, 1928 mark the date of Mickey's "birth?" 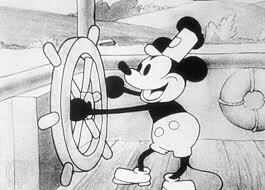 This was the day that the animated short film Steamboat Willie came out, which was Mickey Mouse's debut. In that film, Walt himself provided the voices for all the characters. However, there isn't any spoken dialogue, just whistles, grunts, laughter and other vocal sounds. It was the beginning of a long and very successful career for Walt and Mickey. 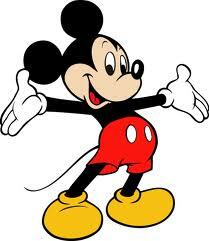 Mickey went on to star in over 130 films and 4 television series. Beyond Mickey's fame as an animated film and tv star, he is the most beloved character in the Disney parks. As the "big cheese" he continues to command the longest lines and largest crowds of adoring fans looking to get a picture or an autograph. Town Square Theater in the Magic Kingdom recently became the primary meet-and-greet location for Mickey and Minnie. You can actually get a FASTPASS there to avoid the typically long wait times to meet the mice. Guests get to go "backstage" into Mickey's dressing room to get their picture taken with him and Minnie. The amount of detail that Disney put into this area is amazing. Mickey Mouse has been a household name for nearly a century. He has entertained kids and kids at heart from all over the world. It is very fitting that there is a sculpture of Mickey and his creator right in the middle of the hub in the Magic Kingdom. 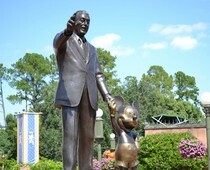 The "Partners" statue is a tribute to wonderful man and his little friend, Mickey. It was Walt Disney himself who was quoted as saying "I only hope that we never lose sight of one thing - that it was all started by a mouse." This picture was taken back in April of 2007. I am posting this one today in honor of Mickey's 83rd birthday. This was the first time that our son met the "big cheese." His expression is pretty interesting. I think if he could talk he would have said, "Seriously? You are seriously introducing me to a five foot tall mouse?" This photo was taken in March of 2006. This shot of Fantasmic is toward the end of the show where the entire lagoon is engulfed in flames. Fantasmic is a must-see nighttime spectacular that takes place in a huge amphitheater in Hollywood Studios. This outdoor arena holds close to 10,000 guests and it routinely fills to capacity. If you haven't seen Fantasmic, make sure to check it out on your next trip! This shot was taken back in January of 2010. This "Steamboat Willie" picture spot was located in the mini museum next to the theater in the back of Town Square Exposition Hall. This was a quiet area behind the camera center that was a great place to get away from the heat and crowds of Main Street, U.S.A. Town Square Exposition Hall was renovated this year and reopened as Town Square Theater. It is now the meet- and-greet location for Mickey and Minnie, as well as a temporary meet-and-greet spot for the princesses. This picture was taken in March of 2008. Mission Space is a very unique thrill ride. It is the only attraction at Walt Disney World that contains vomit bags in front of each seat. There are actually two versions of the ride, and only one uses the spinning centrifuge that puts the "sickness" in motion sickness. Prior to Mission Space, the attraction that occupied this spot was Horizons. As exciting and innovative as Mission Space is, most of us old school Disney fans really miss Horizons. This photo was taken in April of 2008. Our little guy was still a little too "junior" for Shrunken Ned's Junior Jungle Boats in the Magic Kingdom. These coin operated, remote control vessels are located right outside of the Jungle Cruise in Adventureland. I think our now five year old boy will be just about tall enough to skipper his own boat on our next trip. Earlier this year, the Magic Kingdom debuted a new nighttime show called The Magic, The Memories and You! It is a wonderful addition to the entertainment offerings at the park and is very unique. Using state-of-the art, high definition projectors, Disney transforms Cinderella Castle into a canvas unlike anything ever seen before. The castle comes to life like a giant, three dimensional movie screen that is difficult to describe and really needs to be seen in person. I had the opportunity to view the show in July and it was breathtaking. In addition to the vibrant and colorful images displayed on the castle, there is also a moving soundtrack that embodies the typical emotion you'd expect with a Disney World show. However, what I've described so far is just the background to the actual theme of the show. The subjects displayed on Cinderella Castle are actual guests who were photographed in the Magic Kingdom earlier that day. The pictures come from the thousands of shots that Disney's PhotoPass photographers take throughout the Magic Kingdom each day. All of the photos taken before 3:00 pm are taken under consideration to be used in The Magic, The Memories and You! So, it is entirely possible that if you are visiting the Magic Kingdom on any given day, your picture may be displayed during the show for everyone to see. Now, these images displayed on the castle vary in size and are only visible for a few seconds, but it must be quite a thrill to see your family in the show. The chances of your PhotoPass picture making it into The Magic, The Memories and You! are pretty slim. Even if your photo makes it into the show, it may be very difficult to recognize as quickly as most of them appear and disappear. However, Disney has now made it possible for all of us to experience a little magic, similar to what is seen in the show. They have created a website at www.disneymemoriesshow.com that brilliantly mixes some modern technology with social media to give us the ability to see our own pictures on Cinderella Castle in a scaled down version of the The Magic, The Memories and You! Disneymemoriesshow.com is a very simple website to use. You simply click on the spot labeled "Connect using Facebook" and that is all there is to it. The site then goes into your Facebook account and imports your pictures to create the show. 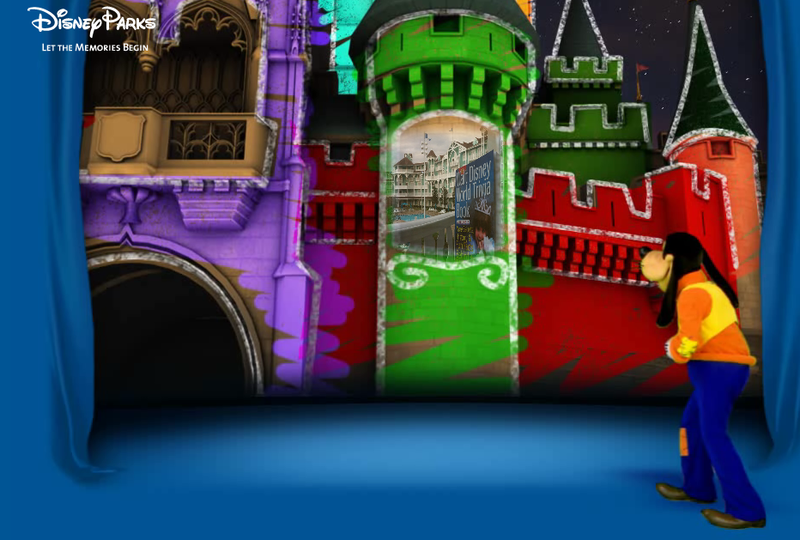 In a matter of moments, Goofy is standing there amidst your photos hanging on a blue curtain. Before you know it, the curtain opens, the music picks up, and the castle appears. 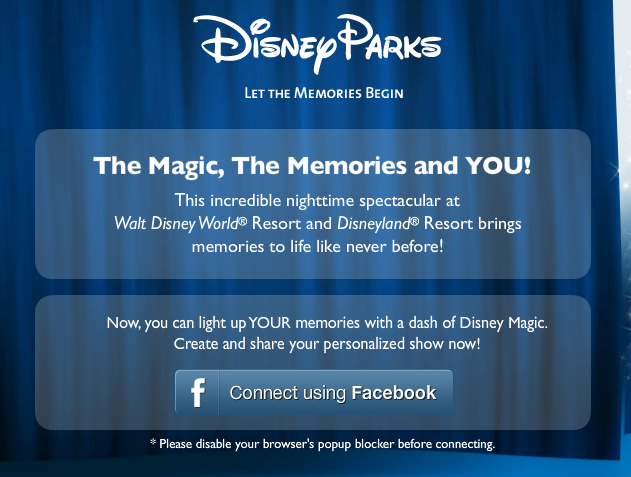 You are now treated to your own, mini version of The Magic, The Memories and You! If you have a Facebook account, I highly recommend heading over to www.disneymemorieshow.com. In addition to creating your own version of The Magic, The Memories and You!, you can check out a condensed version of the actual show from Walt Disney World. Incidentally, Disneyland also presents the show on a nightly basis, but at that park it takes place on the huge mural of it's a small world. You can also see a condensed version of the Disneyland show at www.disneymemoriesshow.com. DDW Pic 79. Main Street, U.S.A. This photo was taken in March of 2006. This horse-pulled trolley can be seen here heading south down Main Street, U.S.A. with the Dapper Dans (the great barber shop quartet) riding along. This turn of the century style trolley car is a fun way to travel from Town Square to Cinderella Castle or vice versa. If you are lucky enough to have the Dapper Dans aboard, you get the added bonus of live music! This picture was taken in September of 2009. This is a float from the Block Party Bash parade at Hollywood Studios. It was originally in Disneyland but was moved to Walt Disney World in 2008. This high energy, crowd engaging, parade ran from March of 2008 through 2010. It was replaced by the Pixar Pals Countdown to Fun parade in early 2011. This photo was taken back in April of 2010. Harper's Mill is on Tom Sawyer Island in Frontierland at the Magic Kingdom. Tom Sawyer Island is a favorite spot for my son and I to have a little "man time" while mom does some shopping. When you walk into Harper's Mill you can actually hear the gears "creak" to the tune of Down by the Old Mill Stream. This aerial shot was taken in December of 2008. You can see just about all of Hollywood Studios in this photo. Notice the size of the Rock n' Roller Coaster building on the far left edge of the shot. It is also interesting to see that the parking lot is almost as big as the park itself. We were flying at about 3,000 feet when I snapped this one. The post 9/11 flight rules don't let planes get much closer than this. However, it was still amazing to see Walt Disney World from this vantage point. Since I was a young boy, I wanted to be a pilot, was a huge fan of Disney World, and loved baseball. This 2008 flight was sort of a dream come true for me. The fact that I was also instructing a former MLB All-Star at the same time was icing on the cake! This photo was taken on our latest trip in July. I was standing on the balcony of our Bay Lake Tower villa when I took this shot. Technically, this wasn't even a "theme park view" room, but it was right on the edge of that category and we obviously had a pretty nice look at the Magic Kingdom. This has to be one of my favorite pictures from any trip to Walt Disney World. It was my computer wallpaper for quite a while! The Polynesian was one of the three original resorts on Walt Disney World property, along with the Contemporary and Fort Wilderness Campground. 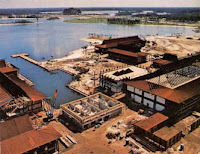 When it opened on October 1st, 1971, it was called the Polynesian Village Resort Hotel. One of Disney's deluxe resorts, it sits on the shores of the Seven Seas Lagoon and has the theming and feel of a tropical island in the South Pacific. Although I have only stayed there once, back in the late 80's, I have visited the Polynesian on a majority of my vacations. Whether it was for a character breakfast at 'Ohana or to rent a Sea Raycer speed boat, the Poly has always been a favorite of mine. For anyone who has visited or is considering a stay at this Magic Kingdom resort, there is one definitive fan website that simply must be bookmarked. It can be found at Tikimanpages.com. There are many websites devoted to specific resorts and attractions, but Tikiman Pages has to be one of the best. Although it is an "unofficial" site, it looks very professional and has an amazing amount of content. It was created over ten years ago by Disney World fan, Steve Seifert. Steve does a great job of mixing interesting stories about the history of the Polynesian with useful and up-to-date information about the resort. His attention to detail and passion for the this tropical paradise make Tikimanpages.com tops among Disney World fan sites. Tikiman Pages contains four major sections. First, the "Home" page contains the latest articles from Steve. This is also where you find the basics about the resort under the headings of Amenities, Dining, Planning and Longhouses. Each of of theses areas contains the overall details about today's Polynesian, including information on shops, restaurants and the resort rooms. In the Longhouse section, for example, you will find specific facts related to the different buildings as well as the pros and cons of staying in each one. Again, the level of detail that Steve includes is nearly unbelievable. You can even hear an audio clip of the pronunciation of each of the longhouse names. Speaking of audio, while you are browsing the home page you are treated to music tracks that can be heard around the resort. This just adds to the complete Tikiman Pages experience. The second major section of this website is completely dedicated to the history of the Polynesian. As a Walt Disney World geek, this is my favorite area of Tikimanpages.com. Steve does a great job of documenting the complete story of the resort from construction, to additions, to what we have today. Also, he includes some fantastic and rare photos from throughout the years, along with artist renderings and diagrams. This area of the site is great from both a historic as well as nostalgic perspective. Browsing through the pictures helps to bring back great memories of visiting with my family over the years. The material that Steve shares here is significant to diehard Disney fans, as he preserves the heritage and the stories that otherwise may be lost as time continues to pass. The third section of the Tikiman Pages falls under the heading of "News." This is where Steve keeps us abreast of the current happenings at the Polynesian. He writes one or two articles a month about everything from construction updates, to resort rumors, to special events. If there was something interesting or new coming out of this resort, you would certainly read about it here. The final area of the website is the "Links" section. Here you can find Steve's favorite websites related to Walt Disney World. There are links to trip planning sites, info sites and even other unofficial resort sites. I have reviewed many of these here on Digital Disney World. Steve's list is comprehensive and I have discovered some websites here that I hadn't seen before. Tikiman Pages is one of those websites that I had heard about in passing but hadn't really explored until recently. To say that I'm impressed is an understatement. For anyone who has even a slight interest in the Polynesian Resort, this site should not be overlooked. I highly recommend checking out Steve's site at Tikimanpages.com. You won't be sorry! This photo was taken on our most recent trip in July. This view of the Bay Lake Tower pool was taken from an elevator lobby on one of the higher floors of the resort. This is a great pool for kids and adults. It has a fun water slide and an adjacent hot tub. Although, I have to say that when I got into the hot tub in the heat of a July afternoon in Florida, the water didn't really feel much hotter! This photo was taken in April of 2007. We were sitting on the train at the Main Street Station when I snapped this shot. This view is looking out over the Magic Kingdom entrance towards the Seven Seas Lagoon. I was able to catch the monorail going by on this crystal clear afternoon. Incidentally, the view from the entrance area looking back towards the train station is the most photographed spot in the World. I'm not talking just "Disney" World, I'm talking about the entire Earth! It makes sense when you think about it. 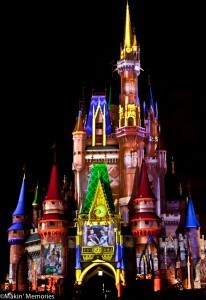 Walt Disney World is the number one vacation destination and the Magic Kingdom is the busiest theme park. It stands to reason that the huge Mickey flower bed in front of the entrance would be a pretty darn popular spot to take a picture. This photo was taken in March of 2006. These huge bats are located along the walking trail of the Maharajah Jungle Trek at the Animal Kingdom. It is an amazing exhibit in that there is no glass between the guests and bats. There are wooden dowels spaced about eight inches apart and the handlers say that the bats could never get through due to their large wing span. As you can see, this setup allows guests to get very clear pictures of these interesting creatures! This photo was taken in March of 2006. I am hanging with Mr. and Mrs. Potato Head near the 80's section of the Pop Century Resort. This photo of "Walt" and I was taken back in April of 2003 at the Disney MGM Studios. I thought it was fitting that I post this shot on this momentous occasion. I am both excited and truly appreciative to say that Digital Disney World just passed 10,000 "page views." I never thought it would be possible for my little start up blog to achieve this in just over ten months. I can't thank you all enough for taking the time each day to check out my latest postings. I have truly been inspired this year to pursue my lifelong Disney World career goals, and I continue to move closer to turning this passion into a profession. Thank you once again for reading Digital Disney World and feeding my desire to write about this place we enjoy so much. Have a Disneyriffic day!